James Harden received a truck load of Adidas gear, with the official start of his contract being filmed and turned into a commercial. Harden signed a $200 million deal with Adidas that didn’t start until Oct. 1, because technically he couldn’t publicly wear adidas stuff because of a non-compete clause in his previous deal with Nike. 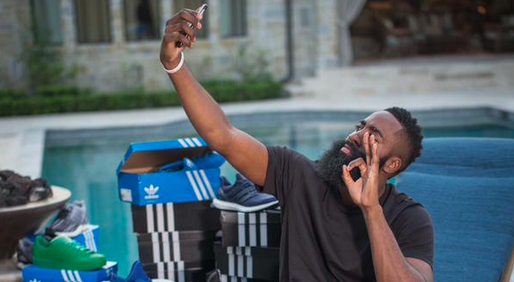 Harden received his kicks from an Adidas rep, who then happily showed us all the swagged out colorways.